What is a SID ? SID stands for Sound interface Device which is an IC produced by MOS technologies in the 80's through to the mid 90's. In short is is a stand alone sound synthesizer chip, most likely the finest one ever created. It was used in the legendary Commodore 64 computer as well as some other variants. 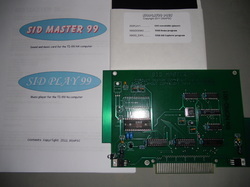 Sid Master 99 is a PEB interface cards that integrates an MOS 6581 or MOS 8580 SID chip into the architecture of the TI99/4A as a memory mapped device. It can be accessed through any language that allows normal CPU memory access such as assembly language, Extended BASIC etc. If you can do a CALL LOAD or equivalent then you can access the SID chip. A new vista of never before heard sounds can now be played through your TI99/4A. No sound cables required. It is completely compatible with the existing sound chip on the computer and plays through your monitor or TV..
What is SID Play 99? Sid Play 99 is simply a music player. Think of it as a 1980's MP3 player. It is capable of playing most of the songs that are contained in the CGSC (over 8000 as of this writing.) Everything from classical piano to Bohemian Rhapsody. Paired with the SID Master 99 card, Sid Play 99 will provide you over 300 hours of unique music. What are SID files ? SID files are simply songs that were originally encoded in the 80's and early 90's by talented individuals in the C64 community. They are NOT 6510 CPU code but rather SID info data in a special file format. This is what makes them playable on the TI99 equipped with a SID Master PEB Card. All that was needed was a method to decode the files and play them using 9900 machine language (hence the SID Play 99 program.) The original file structure was created for The Compute! Gazzette SID Player.) Below is a SID file being played on a TI.